BELLFLOWER – Bellflower High School honored 136 members of its Class of 2017 with academic honors, recognition of athletic prowess and service efforts during a Senior Awards Night held June 6 at the high school. Thirteen students were recognized for achieving highest honors, 32 for high honors and 64 for honors, indicating GPAs of 4.0 and above, 3.5 to 3.99, and 3.0 to 3.49, respectively. In addition, 32 students earned state Seals of Biliteracy, indicating fluency in at least two languages, and 59 students earned Golden Merit Seal Diplomas, signifying mastery of at least six subjects. Three students completed dual-enrollment programs at Cerritos College for students interested in teaching careers, 14 students are being honored with lifetime memberships in the National Honor Society and 19 with lifetime memberships in the California Scholarship Federation. Nine students were honored as Young Black Scholars. Students also received school awards from specific departments as well as honors for service and athletics. 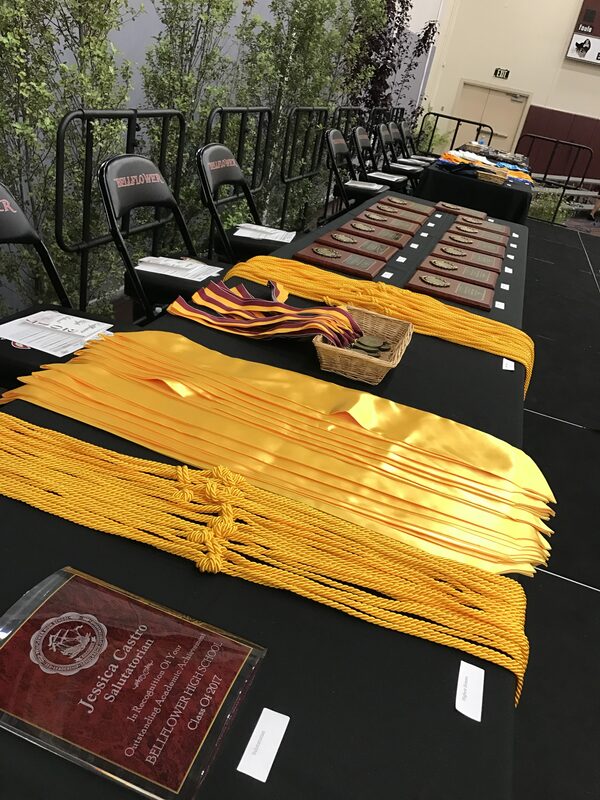 Highest honors: Daniel Arreola, Jessica Castro, David Franco, Hannah Laughlin, Oscar Macias, Louie Maldonado, Brayan Maldonado, Alejandra Ramirez, Celina Rodriguez, Magnolia Sandoval, Nhu Truong, Abraham David Ungos and Yvette Valtierra. High honors: Kelvin Agres, Kirllos Boctor, Hector Bueno, Victoria Camey, Alejandra De Alba, Alyson Delgado, Stephen Deslate, Nancy Gajjar, Katrina Garcia, Joseph Gomez, Jan Patrick Armand Gonzales, Angel Gonzalez, Zymira Harris, Darius Hill, Kevin Ho, Gabriella Holguin, Jacob Jacobo, Michelle Jaime, Mia Lopez, Kimberly Machado, Mina Maglaa, Marlon Molina, Priscilla Nou, Carmen Olmos, Jose Rogelio Ordinario, Hannah Peterson, Ayline Rebollo, Shenandoah Simmers, Jessica Trujillo, Omar Viramontes, James Watson and Sandra Youssef. Honors: Syheim Banks, Gregory De Joseph, Daniela Sandoval, Angela Arceo, Steven Ramirez, Jesus Cuenca, Jason Rubio, Brian Luu, Myjia McCloud, Sammie Hernandez, Daniel Solorzano Mojica, Dejshon Senter, Hannah Mercado, Guadalupe Mendez, Sabrina Morales, Isela Melendrez, Tysean Hill, Jocelyn Gudino, Arianne Leigh Pascua, Natalie Ortega, Roman Delgado, Samantha Tovar, Brian Rodriguez, Sandy Kods, Jesus Joaquin, Latonia Pope, Stephanie Mendoza, Katherine Ipina, Jasmine Lopez, John Rafael Pena, Leslie Amaya, Jessenia Grano Mendoza, Galilea Guerrero, Wayne Levi Ocampo, Jeremy Polizzi, Eric Romo, Itzel Garcia, Audrey Garcia, Hector Diaz, Omar Rodriguez, Samantha Zamorano, Jair Lemus, Jaelyn Johnson, Karla Sales Gonzalez, Jose Ricardo Silva, Vanessa Vargas, Scott Flood, Arely Lopez, Adrian Martinez, Bryan Arceo, Jackie Tran, Isabella Roberto, Isamar Fletes, Carlos Lopez, Monica Torres, Madesto Eitile, Jazmin Olivera, Thoai Tran, Francisco Garza, Amanda Chau, Christian Pinzon, Emely Montalvo, Kevin Phan and Brandi Jordan. State Seal of Biliteracy: Hector Bueno, Jessica Castro, Vianca Cornelio, Alejandra De Alba, Roman Delgado, Isamar Fletes, Joseph Gomez, Angel Gonzalez, Jessenia Grano Mendoza, Jocelyn Gudino, Michelle Jaime, Vanessa Lazcon, Arely Lopez, Raquel Martinez, Francisco Medina, Isela Melendrez, Jazmin Olivera, Carmen Olmos, Natalie Ortega, Kevin Phan, Christian Pinzon, Jeremy Polizzi, Antonio Ramirez Rivera, Viviana Rios Villalobos, Eric Romo, Walter Saavedra Vargas, Karla Sales Gonzalez, Jessica Trujillo, Grecia Valenzuela, Servando Valenzuela, Yvette Valtierra and Vanessa Vargas. Golden Merit Seal Diploma: Kelvin Agres, Bryan Arceo, Daniel Arreola, Kirllos Boctor, Hector Bueno, Victoria Camey, Jessica Castro, Amanda Chau, Alejandra De Alba, Alyson Delgado, Stephen John Deslate, Naija Eaton Vital, David Franco, Nancy Gajjar, Audrey Garcia, Joseph Gomez, Jan Patrick Armand Gonzales, Angel Gonzalez, Zymira Harris, Darius Hill, Kevin Ho, Gabriella Holguin, Jacob Jacobo, Jesus Joaquin, Brandi Jordan, Art Kamchareon, Eduardo Lara, Carlos Lopez, Kimberly Machado, Oscar Macias, Mina Maglaa, Brayan Maldonado, Louie Maldonado, Adrian Martinez, Marlon Molina, Priscilla Nou, Jose Rogelio Ordinario, John Rafael Pena, Hannah Peterson, Kevin Phan, Alejandra Ramirez, Ayline Rebollo, Isabella Roberto, Celina Rodriguez, Omar Rodriguez, Magnolia Sandoval, Shenandoah Simmers, Monica Torres, Thoai Tran, Nhu Truong, Abraham David Ungos, Allen Jan Valdez, Yvette Valtierra, Omar Viramontes, Joshua Watkins, James Watson, Sandra Youssef, Samantha Zamorano and Hannah Laughlin. Cerritos College Middle Scholars: Isamar Fletes, Zymira Harris and Stephanie Mendoza. California Scholarship Federation: Kelvin Agres, Kirllos Boctor, Jessica Castro, Alyson Delgado, David Franco, Joseph Gomez, Jacob Jacobo, Michelle Jaime, Kimberly Machado, Brayan Maldonado, Alejandra Ramirez, Celina Rodriguez, Magnolia Sandoval, Shenandoah Simmers, Nhu Truong, Abraham Ungos, Yvette Valtierra, Omar Viramontes and Sandra Youssef. National Honor Society: Kimberly Machado, Victoria Camey, Jazmin Olivera, Mia Lopez, David Franco, Jessenia Grano Mendoza, Emely Montalvo, Natalie Ortega, Hannah Peterson, Alejandra Ramirez, Celina Rodriguez, Magnolia Sandoval, Shenandoah Simmers and Yvette Valtierra. Young Black Scholars: Syheim Banks, Floyd Bell, Naija Eaton, Zymira Harris, Hannah Peterson, Latonia Pope, Taliese Pressley, Iyanna Tinner and Jazmine Walker. Department awards: Visual Arts, Nattan Jiraratthakorn; Life Skills, Jennifer Stanger; English Language Arts, Yvette Valtierra; English Language Learners, Brenda Ramirez Rivas; World Languages, Isela Melendrez; General Studies, Jonathan Sanchez; History/Social Science, Priscilla Nou; Career Technical Education, Gage Graham; Mathematics, Daniel Arreola; Performing Arts/Choral, Floyd Bell; Performing Arts/Theater Arts, David Franco; Performing Arts/Instrumental Music James Torres; and Science, Celina Rodriguez. Service and sports honors: Earle K. Smith Service Above Self Award, Jelan Barrientos; Athlete of the Year, Christian Pinzon; Male Tri-Athlete of the Year, Devin Medina, Female Tri-Athletes of the Year, Mia Lopez and Priscilla Nou; Outstanding Service Award, David Franco; Buc PRIDE award, Magnolia Sandoval. Bellflower High School’s Class of 2017 also received more than $11,000 in scholarships from school and community groups. BUSD_BHS_Honors_1: Bellflower High School honored 136 members of its Class of 2017 with academic honors, recognition of athletic prowess and service to school during a Senior Awards Night held June 6 at the high school. Bellflower High School honored 136 members of its Class of 2017 with academic honors, recognition of athletic prowess and service to school during a Senior Awards Night held June 6 at the high school.